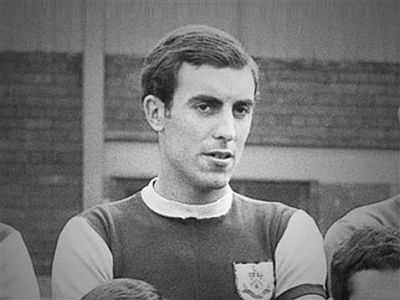 Walker played just 40 times for the Clarets having made his debut in the League Cup at Brentford in November 1960, making his league debut two months later, but there was always stiff competition for the right-half position. In that 1960/61 season, Walter Joyce had taken the number four shirt with Jimmy Adamson moving to centre-half, but he was behind both and then, in 1963, the emergence of Brian O'Neil limited his first team appearances significantly. He played 15 league games in 1962/63, his best season, and 12 in 1964/65 which saw him play his final game at Leeds in March 1965. That summer he moved to Southampton and helped them win promotion to the First Division for the first ever time. He went on to make 189 league appearances for the Saints but was no longer a regular once O'Neil became a team mate again. He was eventually released in 1973 and moved to South Africa to play for and coach Cape Town City before returning to England and settling in the Southampton area where he built up a successful antiques business. David Walker was one of the few local footballers at Turf Moor to make it into the first team, having hailed from Colne. Clarets Mad would wish to pass on our condolences to his family and friends at this sad time.